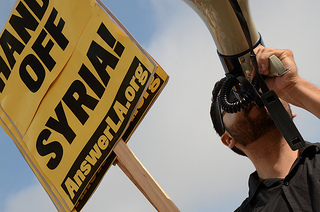 Protest in LA demands: "Hands off Syria"
On June 8, activists rallied outside the United States Federal Building in Los Angeles against U.S. and Israeli intervention in Syria. The rally was initiated by the ANSWER Coalition (Act Now to Stop War and End Racism) and Arab Americans 4 Syria. It was co-sponsored by over a dozen community organizations. Gathered at a major traffic intersection, people of all ages and nationalities chanted loudly holding signs reading “Hands Off Syria” and “Money for jobs and schools—Not war in Syria!” Demonstrators were supported by constant honking from passing traffic. Just down the street from the University of California – Los Angeles (UCLA) campus, many young students were in attendance to highlight the hypocrisy of massive budget cuts and tuition hikes to the University of California school system, while there are billions of tax dollars to pour into U.S. wars. As the Syrian military has recently made significant gains against the imperialist-backed rebels—and the plan of the United States and its partners unraveling—this demonstration brought the issue into the public spotlight in anticipation of the U.S. government seeking to accelerate its intervention to salvage its hopes of overthrowing the Syrian government. Counter-demonstrators from the “Iranian Monarchist Movement” attempted to disrupt the action by bringing pro-war signs and banners into the rally, but were kept out by the organizers. In addition to carrying out this public action, the rally brought together a broad coalition of activists and organizations who repeatedly expressed through their speeches that they would continue to organize together against intervention in Syria, prepared to act in the face of any escalation.